Yesterday I had some time all to myself and thought I would spend some of it sewing. As I was digging through the pile of mending on my sewing chair I came across E's wheat bag. He discovered a small hole in it last week, he often puts it in the microwave for just a little too long, and I think at some point the wheat must have burnt a bit of a hole into the flannel. It needed replacing anyway, the flannel was definitely worse for wear. This time I decided to use some unbleached cotton (I had some on hand from the yardage I had for making cloth shopping bags) to make a base bag, and then I would make a separate removable flannel cover. That way I would be able to launder the cover when needed. As I started to work on that I was thinking about a friend who had just broken her leg and was on couch rest. 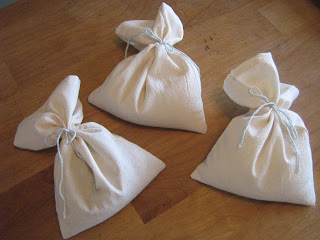 I couldn't think of anything I could do to ease her pain but I do want to help, so I thought I would make her some mini-wheat (ha ha, mini-wheat) bags to help ease some of her aches and pains. And soon, when she is all nicely healed, and feeling fantastic again, she can use them on the little ones in her life. Now...better get back to E's wheat bag cover. oooooooh! i hope i'm the only friend in your life who's just broken her leg!! (for more than one reason!!) what a GREAT idea to have mini-wheat (hee!) bags! i just have great big ones!